“We are called to be saints,” he said in the homily during the Mass for his installation as the fifth bishop to head the Diocese of Rockville Centre. Bishop Barres, 56, said he looked forward “to experiencing the vibrant, welcoming, new evangelizing parishes of the diocese” and getting to know as many people as possible. He succeeds Bishop William F. Murphy, 76, who had headed the diocese since 2001 until his retirement was accepted by the pope in December. 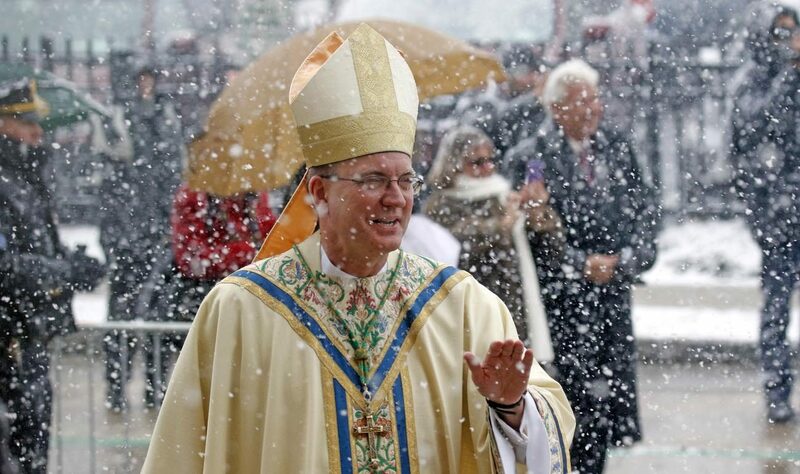 When he was named to Rockville Centre Dec. 9, Bishop Barres had headed the Diocese of Allentown, Pennsylvania, since 2009. Catholics of the Rockville Centre Diocese were joined in the packed cathedral by many people who arrived by bus from Bishop Barres’ former diocese. Others in attendance included local government leaders and several ecumenical and interfaith leaders of Long Island. Before the Mass began, as the diocesan choir sang, a procession of hundreds of clergy, including more than 60 bishops and three cardinals. The prelates included Bishop Murphy, New York Cardinal Timothy M. Dolan, who was the main presider, and Archbishop Christophe Pierre, the apostolic nuncio to the United States. Then, Cardinal Dolan and Archbishop Pierre escorted Bishop Barres to the cathedra, the bishop’s chair. He was presented with his crosier, or bishop’s staff, and then was greeted by representatives of the diocese, as well as civic, ecumenical and interfaith leaders. In addition to greeting the active Catholics in his new diocese, Bishop Barres reached out to those who have been away from the Catholic Church. During his tenure in Allentown, Bishop Barres initiated a pastoral planning process for parishes across the diocese. He called on every parish to establish a parish council and made support for Catholic schools a priority; enhanced evangelization and pastoral ministries; and encouraged use of social media to spread the Gospel and evangelize. On the national level, he is a member of the U.S. Conference of Catholic Bishops’ Committee on Evangelization and Catechesis and is the USCCB’s episcopal liaison to the Pontifical Mission Societies. The Long Island Catholic, magazine of the Diocese of Rockville Centre, contributed to this story. NEXT: Summer gathering of Catholic leaders meant to revitalize church in U.S.